Description: During this time,. CSX was running some detours viqa the NYS&W since they had a tie project going on on the River Line (?). In order to go from the NYS&W soutbound to the Southern Tier eastbound, this required pulling down into CP's Yard, then shoving westbound on the Tier to clear CP BD, then eastbound. These detours became pretty regular and finally some money was spent near CP BD that would allow for this crazy move to go away. Description: Eastbound we go on the Tier! 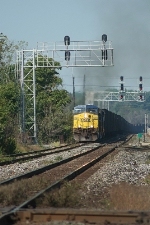 Description: CSX 541 leads a empty hopper train across US 221 North to begin the trip up the loops. Title: This would be a nice back yard to have! Description: An eastbund train of loaded coal hoppers is racing along the Kanawha River just past East Bank. Description: A coal train rolls south under highway 76 at Adams. Description: CSXT 541 West, clear at JC Cabin, on the main, 541 west out. Description: Eastbound CSX gen freight with 5 units on the ex PRR high line.